The New Year brings many ideas for personal improvement and many people also have resolutions for their home. What can you do for your home that will give you the most pleasure and also improve your home value? According the NAR (National Association of Realtors) and their “2015 Remodeling Impact Report” the answer is most likely found in your kitchen. Whether the project is an upgrade or a total renovation, your kitchen proves to be the heart of your home, returning both joy and value to you. The NAR report gave a “joy score” of 9.8 out of 10.0 for kitchen renovations. Top reasons to upgrade or renovate include replacing worn-out surfaces and finishes and the desire to modernize. The first surface that comes to mind is always the counter. The top trend in counter surfaces today is a “solid surface.” Solid surfaces include quartz, granite, marble, concrete, and metal. Gleaming surfaces are both inviting and soothing, adding to the feeling of joy. Top names in engineered quartz counters are Silestone, Cambria, and Cezarstone. These surfaces have become very popular as they are very easy to maintain (no polishing required) and are heat resistant. They are non-porous so are less likely to stain. Granite comes in many colors and natural patterns and has been popular for the past decade. Marble has been featured in quality homes for baking for a long time and comes in both polished and honed finishes. Recently, tinted concrete and stainless steel counter tops are becoming more popular for their ease of cleaning and cost. The desire for a more modern kitchen often means a more open floor plan. Since the kitchen is truly the “heart” of the home, we tend to entertain in the kitchen and from the kitchen. No longer is the kitchen a small room that tempts us with great aromas, but it is the stage for the art of cooking and entertaining. Parenting is also easier if you can see your children while you are preparing their meals! As you modernize the kitchen, don’t forget the great appliances that are available. High tech in design and function, they add to the look and comfort of your home. Just as in countertops, appliances come in many surfaces and colors. Stainless steel is the top seller, but many homeowners also choose to use their cabinet surface choice as their appliance surface so that appliances blend into the kitchen. One of the new trends in appliances is an architectural vent hood. It can even be the focal point of the kitchen, rising above a central cooking island or against a feature wall. In an open kitchen design, this feature is often the most admired and garners the most approving comments. New technology in the kitchen is another source for greater ease in life and more pleasure for the homeowners. 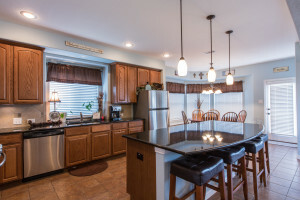 Not only can a renovated or remodeled kitchen bring more joy to the homeowners, it also adds value to the resale of the home. Start the New Year off with a plan for a new kitchen that reflects your personality and your joy in your home.